Left to right: Diana Arnold, Supervisor, Health Services Program, NB Department of Social Development; Courtney Keenan, Ability NB President & Mike McAloon, Ability NB Board member. Health Services, NB Department of Social Development – We were pleased to present our Caring Community Partner Award to the Department of Social Development, Health Services program. 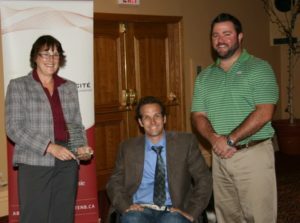 This award is presented in recognition of the outstanding leadership the program has shown in the development of a program benefit for pressure redistribution mattresses and overlays, and hospital beds. We believe the partnership between Social Development and Ability NB on this initiative is a best practice example of how good public policy is developed. The policy and program changes involved have had a significant impact on the health, economic and social inclusion of persons with disabilities in NB. Dianna Arnold and her team work hard to provide clients with funding for appropriate equipment and supplies and we recognize them as key community partners in our service delivery. A special thank you is also extended to former Assistant Deputy Minister Wendy McLeod-MacKnight and Assistant Deputy Minister Jack Brown for their leadership in these policy and program changes.